Possessing no less than 24 years’ worth of RS lineage, the high-performing RS4 also happens to be Audi’s most practical family car bar none, states Iain Robertson, but it also carries one hell of a hefty price tag, once you spec it up. Gone are the days of Audi Sport producing a solitary RS model and leaving a desirability gap until the next variant re-excited the market. For the past few years, the company has worked to a principle of supplying to demand, which means that a few RS (standing for Renn Sport, in German) models are now on the luxury brand’s current price list. As a more focused high-performance line-up to the S variants, a more ‘basic’ level of equipment means that owners can ‘spec-up’ their RSs by dipping into the firm’s extensive and expensive options and accessories catalogue. Back in 1994 (M-reg), the Porsche-developed RS2 made its debut. While Porsche is now owned totally by the VW Group, as with Audi, at the time it was a kissing cousin possessing an engineering department that worked for several car manufacturers, although it always held an historically close relationship with Volkswagen. Sitting purposefully lower on beefier alloy wheels and fatter, grippier tyres than the A4 Avant (estate car) that fostered its existence, while boasting of a 311bhp version of the company’s 2.2-litre, five-cylinder engine, which was enough to propel it to around 165mph and despatch 0-60mph in a mere 4.5s, it established a precedent almost quarter of a century ago. Since that auspicious launch, it could be suggested that the brand’s innate sense of confidence, allied to phenomenal competence, has resulted in a state of awesome reverence. Even though a competitive need existed for the Audi range to satisfy an increasingly broad consumer remit, which led to both S and S-Line versions being developed, it has never diluted the impact of the RS model of the day. All Audis present well but the RS alternatives spin heads and evoke the vital ‘Wow!’ factor among young and old alike. It is a level of recognition that many of Audi’s rivals would love to borrow on occasion but, as Audi owns it, its swagger is both potent and understandable. The latest RS4 takes a well-trodden path to its on-street presence. 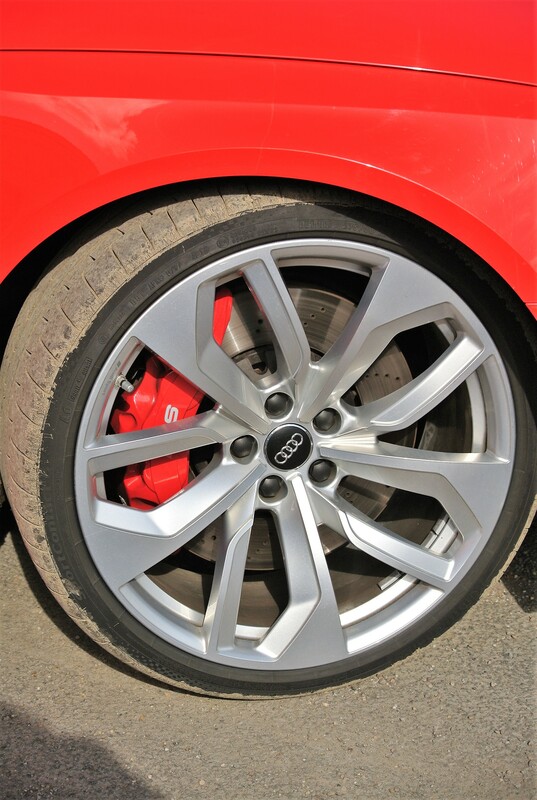 Blistered wheel-arches covering optional 20-inch forged (not cast but costing £2,000 extra) light alloy wheels – 19.0-diameter versions are standard – and appropriately ultra-low-profile tyres are immediate identifiers. Yet, peer a little closer and you spot the drainpipe dimension, twin exhaust tail-pipes (+£1,200) and neat little air-vents at the lamp unit extremities fore and aft, the dinner-plate sized, ventilated brake discs, complete with red-painted RS callipers (+£400), and the utterly lovely, honeycomb pattern, light grey Nappa hide sports seats. Nothing is wasted. Nothing is excessive. It all seems to be just right for the RS4 driver. Hunkered down to the road surface, with an ever-so-slightly raised nose (sports suspension with Dynamic Ride Control – +£2,000), the RS4 looks rapid before the pushbutton starter activates its 2.9-litre, multi-valve, bi-turbo, petrol V6 engine. Carry out that effortless action and it bursts into life with a teensy cough and a rich burble from the tuned exhaust system. As with the RS5, the unit develops a meaty 446bhp (450ps) at between 5,700-6,700rpm. It is a figure matched by an equally impressive 442lbs ft of torque developed between a lowly 1,900 to a punchy 5,000rpm, which happens to be the most appropriate action range for most motoring demands and highlights the remarkably plateau-like power curve. However, the figures belie the utterly visceral experience that results from flooring the throttle on the first open road opportunity. Kicking-down the 8-speed automatic transmission produces an initial bass response from the engine, which soon blends into a higher-pitched ‘yowl’ with each fast-approaching red-line shift up the ratios, every millisecond precise gearchange producing a flat ‘blart’ from the over-fuelled exhaust. 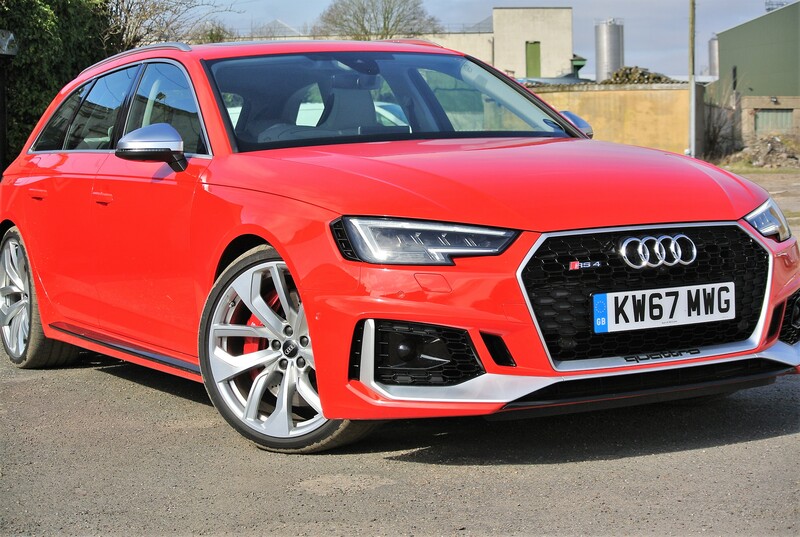 It is exciting and almost matched by the shock of despatching the 0-60mph benchmark dash in a mere 3.7s, before the RS4 courses upwards to its re-programmed (but speed-restricted +£1,450) maximum velocity of 174mph…the same as the RS5, although I have no way to confirm it in the UK. Incidentally, I recorded a satisfying 30.8mpg driving between Lincoln and Lutterworth, which compares very favourably with a posted 32.1mpg Official Combined return riding on the big wheels. All the while, the heated sports front seats (+£300 and +£200 for electric operation) cosset the driver’s rump, back and shoulders, with little roll-out thigh pads for additional support. 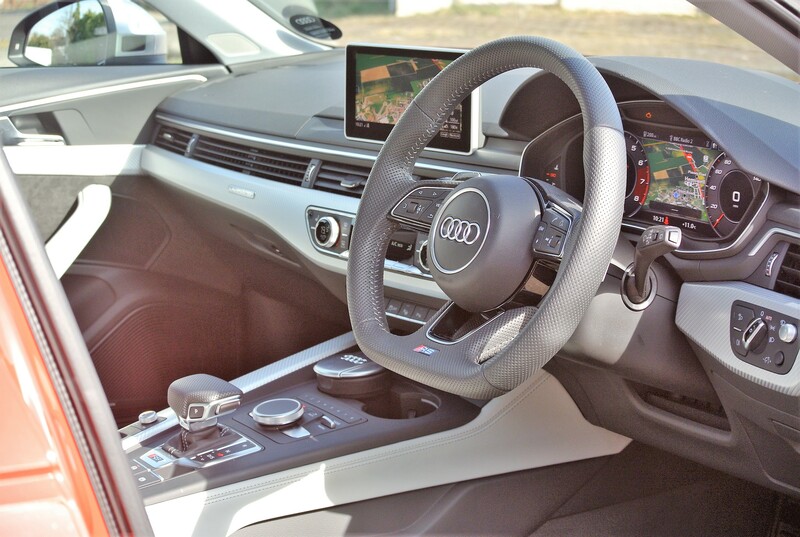 The thick-rimmed, small-diameter, flat-bottomed steering wheel is a delight to wield, effort being reduced by the electronic power steering that is weighted precisely for the most accurate of responses. However, the variable dampers ensure that even fast progress never feels less than totally controlled by the car’s chassis. Thanks to its quattro all-wheel-drive system, traction is never an issue and even a fast-driven supercar would be incapable of losing a following RS4 on a cross-country drive. Its ride and handling is magnificent and involving but you do need your wits about you, because the steering is ever so clinical and devoid of proper feedback. Yet, I cannot fault the powerful brakes, or the effortless and ridiculously fast-shifting auto-box. It is this level of dynamic competence that makes the car’s £59,740 price tag (to which you must add £645 for the Misano Red paint finish and, in the case of this test car, another £16,780’s worth of optional extras that includes the head-up display, parking assist, panoramic sunroof and Bang & Olufsen stereo) so appealing. Although more than up to the real-time, on-road performance standards set by any number of exotic sports cars, the RS4 looks conspicuously like a bargain! Naturally, at that price, emitting 200g/km CO2 means that its first year’s road tax is a hefty £1,200, followed by a further four years of a four-figures government weighted levy before reverting to the £145 standard fee. 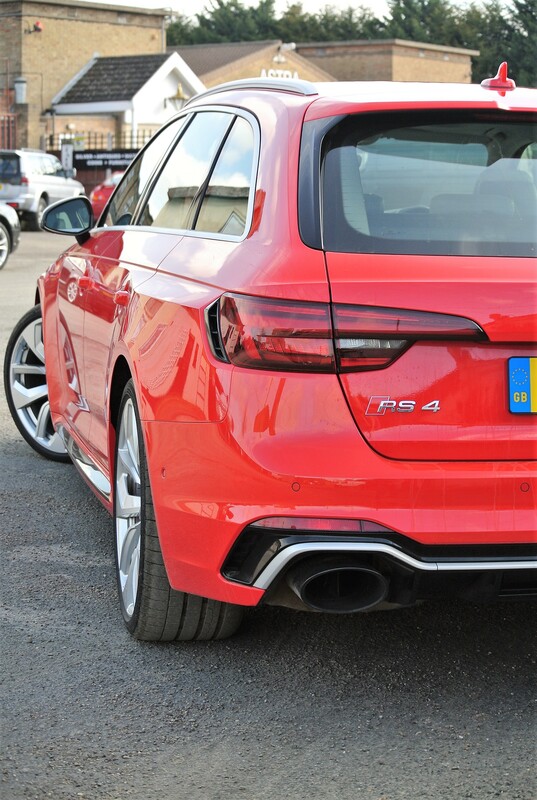 Keep pinching yourself, because you need to remember that the RS4 Avant is capable of transporting a partner, two children, granny and a pair of passport-carrying red setters on a trans-continental, high-speed jaunt. Reaching Val D’Isere, or your chosen European holiday destination, faster than hopping onto a plane at Heathrow, has to harbour some familial benefits. Should you ditch the dogs, there is an accommodating 505-litres of boot space beneath the parcel-shelf, which can be expanded to 1,510-litres, with the rear seats folded forwards. RS4 is the epitome of practicality. The big question with any car of this classification is, would I spend my firm’s cash on one? Well, I can state categorically that I would (were I to have it), thanks to the car’s all-encompassing range of capabilities and I would also recognise that, despite a moderately high price tag, the Audi RS4 does provide outstanding value-for-money…don’t worry, I haven’t lost it totally…against the likes of a new Lamborghini, Ferrari, Maserati, or Porsche. As a prestigious business car, it looks the part and you can be sure that your local Audi centre will have an attractive finance package, should you be serious about running one. Excellent! So glad you liked it. Keep on reading!